I was always an athlete. I played baseball, football and basketball my entire childhood and through high school. I began to mix in quite a bit of weightlifting as a young adult but stayed incredibly active in ball sports. By my late 20’s, I fell in love with mountain biking after a weightlifting injury soured me on the gym. I started to get pretty serious about racing mountain bikes and road bikes, eventually racing CAT 1 off-road (XC) and masters 30+ on the road. During this time, I also went from a 220 pound weightlifter to a 170 pound cyclist. But before I got to that level, I experienced a fainting episode on my road bike while I was out on a solo training ride in 2004. I was only 29, fit, and healthy. So, how was this possible? I immediately saw a local general cardiologist, who then sent me to a “sports” cardiologist at the University of Florida. They suspected HCM (hypertrophic cardiomyopathy) but could not give me a firm diagnosis. I stopped all activities while the doctors tested me, put me on medication, and then finally sent me on my way. Since I really didn’t get a clear direction, I went back to racing bikes and made some serious gains in fitness over the next four years, which included having a professional coach. At the peak of my racing days in 2008 as a mid-pack CAT 1 XC racer, I ran into some serious trouble during an eight-hour mountain bike race. The symptoms were more like severe dehydration. It was August in central Florida! But, I was convinced that it was related to my heart. Going with my gut, I went to see a cardiologist at Mayo Clinic in Jacksonville where I live. And guess what? They gave me a firm HCM diagnosis and told me to stop all workout activities. To say the least, I was devastated. My HCM is a rather mild case, but it is still HCM. It still can cause SCD (sudden cardiac death). I had minor symptoms and no obstruction. But there was scarring and 1 syncope episode under my belt. The diagnosis turned my world upside down. I stopped training and racing and fell into a little depression. I wrote in my blog (http://toddhatfield.blogspot.com) to help me work through my feelings. Per my doctor’s recommendation, I even started playing golf. I also focused on finishing my degree. I think I even got a little too attached to craft beer. But while this new diagnosis could have sent me into a downward spiral, it really helped me see the need for balance in my life. I started making time for more things other than training and racing. I felt bad that it influenced my girlfriend and now wife, Char, and oldest daughter Avery to venture away from mountain bike racing, but it gave them more time to focus on triathlons, which they were both great at too. Avery eventually found soccer where she now shines in high school and travel level club. Char continued doing triathlons, including Ironman Florida, up until we had our daughter Riley in 2011. We also had a son Caleb in 2013, and Char is now getting back on the triathlon scene as well as some mountain bike racing. Back to my diagnosis … Mayo wanted to implant a defibrillator (ICD), but I was not a fan of this decision. At the time, I worked in electrical maintenance at a manufacturing plant, and I was scared of the potential electrical interference with the device. My company hired a consulting firm to verify the places in the facility that were of concern. To make a long story short, it took Mayo three years to talk me into the ICD. I still wasn’t convinced that my heart wasn’t an “athlete’s heart” and was it was just “thicker.” So in my mind, if I took significant time off from training, then maybe the walls in my heart would decrease in size. You know, muscles atrophy, right? After taking off significant time off, the echo and MRI showed the same results. With the pending birth of my 2nd child Riley, I decided I was better safe than sorry and had the ICD surgery in fall of 2011. I considered it my $90,000 insurance policy! I was still worried about all of the negative possibilities that came with it. What if it shocked me? What if it shocked me wile I was driving? Or holding my baby? Or riding my bike? Ugh, the anxiety was brutal! Plus, I had joined the HCMA (Hypertrophic Cardiomyoptahy Association) to learn as much as I could about HCM. Although the HCMA was very helpful and offered a ton of information and support, the message boards were somewhat scary and depressing with the chatter about all of the bad things associated with HCM such as symptoms and ICD’s and medications and surgery and so on. The message boards started to have a negative impact so I had to stop frequenting them and learn to combat my own battles with anxiety, which eventually became a thing of the past. I learned that my mind was my worst enemy so if I learned to control my thoughts then life could be normal again. Fortunately I also had tons of distractions in my life, so thinking too much about my heart naturally became less and less. The more I learned about HCM and my body and how it responds to various things, I knew I could control symptoms or at least understand them better. The drawback is that the constant thinking about my heart and focus on it when it does all of the daily weird things, like palpitations, becomes such a draining mental burden. After the ICD surgery, I started riding again and did a few road and mountain bike races. I did that 8 hour endurance mountain bike race in 2013 as my return and redemption race and had a great race and awesome result! It was also my first race wearing Ironheart gear! At the end of 2013, our son Caleb was born so riding was shelved a bit after putting in about 3,600 miles that year on the bike. I also looked into genetic testing for my kids since I had it done via GeneDX and Mayo Clinic, and they were able to identify the specific gene that caused my HCM. I also tried, unsuccessfully, to have my family tested. Unfortunately or fortunately depending on how you look at it, 2 of my 3 kids were positive for the HCM gene. This does not necessarily mean that they will ever have HCM, but it lets us know that they could develop HCM and also prompted annual checkups with the cardiologist. This is incredible insight knowing to look for this disease rather than finding out you have it the hard way. My oldest daughter has been getting annual echo screenings since I was diagnosed in 2008 since we knew there was a 50/50 chance of your offspring developing HCM. She is still HCM free, which is always a huge relief, as is my little man Caleb. As far as race stuff, I have been training a decent amount in 2016 and just completed the Off Road Assault on Mt Mitchell which is a 60 mile mountain bike race in Old Fort, NC that included over 10,500 of climbing. It was such an awesome race to not only finish, but to be an ambassador for Ironheart and to be an example of what can be accomplished with a heart disease. 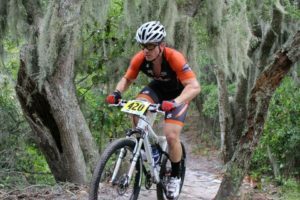 I will also be racing in the 8 Hours of Labor with my wife over Labor Day weekend, which is an 8 hour mountain bike race in hot and humid Gainesville, FL. Our goal is a co-ed team podium finish! 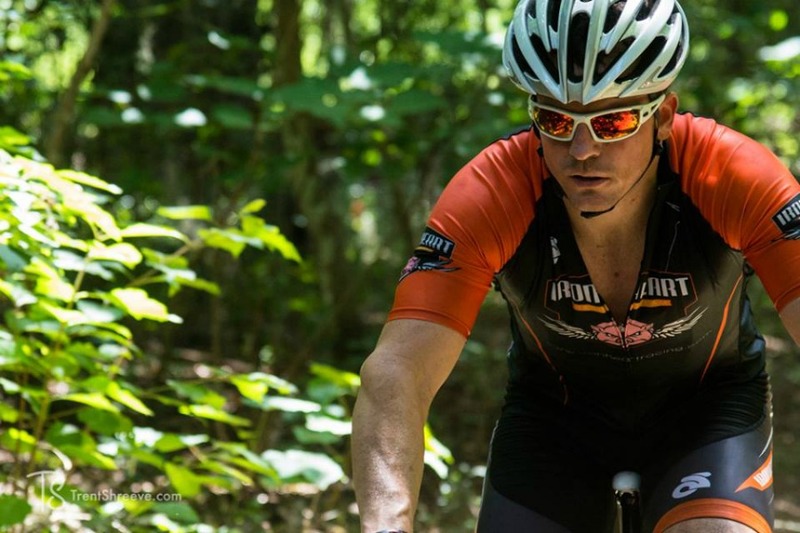 I plan to also pick and choose various mountain bike endurance races in the southeast as well as a few road events like the Six Gap century in north Georgia. The extremely competitive type of racing may not be my thing anymore, but being able to actually do any of this stuff is pretty cool for a guy who was told only 8 years ago that I would be limited to brisk walks and playing golf! The coolest thing that I have done lately was to join the Mayo Clinic team as a Project Manager at their Jacksonville campus. Considering that Mayo figured out my heart issue and was such an incredible part of my journey, what better way to pay them back than a career at the best hospital in the country! Working at Mayo has been a life changer and to this day. When I walk around the campus, I still can’t believe that I work for this incredible organization. I have also been able to participate in studies with Yale University that cover athletes with ICD’s and HCM active lifestyles. I found Ironheart Foundation in 2012 in the oddest way. I had just bought a new road bike from a guy in town, and he knew about my heart condition. He works for a medical device company and knew about Ironheart via one of the cardiologists that he met via his travels. I was intrigued to learn more about Ironheart so after a web search I found Ironheart Foundation and Dave Watkins. It was pretty cool to find this whole network of cardiac athletes! A heart disease diagnosis is not a death sentence, but an opportunity to help folks get through their struggles and realize that an active lifestyle is well within their reach.